Yes, Chris Birchall is from Staffordshire, same as my beloved Stoke City. He is a Port Vale guy, but I can forgive him for that. In the soccer universe he affiliates with Trinidad and Tobago because of his mother. I reckon I could do the same type thing by claiming England as my kickball residence through my mother, but I shantish much good at football -- and that's going the wrong way (or something). Regardless! What?! Jeeze. The timing is off, but this sort of player signing is solid. I have loads of data on him. I also know where he stands in relationship to the rest of the league. So instead of me getting all crazy about his pottery / English-ness, I can confidently evaluate him. But his place on the Columbus Crew? Good question. Looks like Central Defensive Mid (CDM) at the moment. Danny O'Rourke has seen a few games there this year as well as Kirk Urso. Hmm. This lineup / depth chart Crew stuff is getting tricky, so lets clean up this little CDM / stopper spot, shall we? Good player, has a 'sports hernia' and can't seem to get better. Part of me wants to point fingers at the Crew training staff, but it is what it is. He's not game fit. Danny is a multi-purpose defensive player. He can fill in anywhere. Believe it or not, I'd like to see him at right back over Miranda right now but I have a feeling that he will pair up with Josh Williams while Chad Marshall tries to determine his playing future (concussions). I still think the CDM is his natural position but in Coach Warzycha's mind he see's him as an athletic body he can run in the back, no matter the spot. Kirk came out of the gates starting this year. Four games I think. Too much, too early but of the new boys on the Crew he has played the best. So, when you look at it this way you see that picking up a player like Birchall makes sense. That is, if he plays the CDM spot. Columbus has a tendency to put players in spots outside of their natural position. 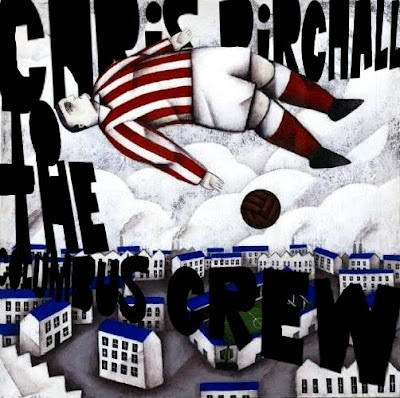 My understanding is that Birchall is a Defensive Mid. A stopper. Chris made $157,125 last year. For those keeping track, don't worry. Crew still last in MLS in terms of wages. I had him rated 189th in the league overall (slightly above average of a 59 rating). He had 23 appearances and 1551 minutes. None of that should diminish the fact that he was an important cog for a LA Galaxy team that posted the 3rd best Goals Against average in Major League Soccer History. That and a dollar will get you a cup of coffee, though. The Crew still have to address problems. Tossing people at it doesn't work and isn't sustainable. The #1 problem with this club? Injury. Columbus desperately needs to work on getting (and keeping) people healthy before anything else. This signing just a band-aid on a wound that isn't healing. There are a handful of other deep rooted problems with Columbus. This is Part III of a series of posts about Crew signings in 2012. More posts to come, just as more signings are coming for our beloved Crew. The base artwork on this post: Paine Proffitt. Search him.